I have read my fair share of conspiracy theories. It seems for every major event that has taken place in this country, there is a conspiracy theory to go along with it. There are some that seem plausible and some that seem way too out there. Was 9/11 an inside job? Is our government made up of shape-shifting reptile aliens? Was the tragedy at Jonestown a CIA cover-up for a failed mind-control project? Was rap music invented by the CIA in order for minorities to kill each other? The ideas people come off with feel so weird coming out of my mouth and even as I type them. But it just goes to show that if someone speaks with enough clarity and passion about something, there are some who will believe them. "Moonwalkers" is a movie that revolves around a conspiracy theory. It never once says that its based on a true story, but it sure does aim for authentic. Ron Perlman plays Kidman, a CIA agent who is given a great, personal task. The American government is in the full swing of the Cold War in 1969, and they are afraid that the Soviet Union might beat them to the moon. No matter what, the American government is determined to get to the moon first, even if they have to fabricate it. Kidman is sent to London in order to find the famous director Stanley Kubrick, he plans to convince the famous director to make a short film of American astronauts landing on the moon. Kidman comes into contact with a rock band manager Jonny (Rupert Grint) to find Kubrick for him. Things don't go as planned and that leaves Kidman and Jonny in charge of making a filmed fake moon landing. Oh yes, there are those that believe that the American's winning the space race was staged, and this is a movie about that conspiracy theory. 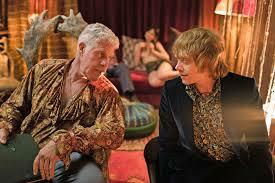 The rest of the movie is a big trippy, funny adventure as Hellboy and Ron Weasley bounce off of each other. And honestly, who wouldn't want to see that? Who wouldn't want to see that pair getting high and chasing women? Who wouldn't want to see that pair stealing money from British firms and blowing their heads off? Perlman and Grint's chemistry and energy in this movie is exquisite. There is really nothing to it on a substance level, but that's okay. We have so much fun watching these two men getting themselves into shenanigans that its not bad. What surprised me the most is just crazy this experience gets. I was expecting a kind offbeat comedy if anything. What I got was a movie that had moments of comedy. It had moments of trippiness (Perlman's character has a particularly looney reaction to a drug). It had moments of crazy action (the final moments of shootout were pretty nuts.) I wasn't expecting this from the movie, but I certainly enjoyed what I got. Rupert Grint is kind channeling Weasley in this a little too much, and we have seen Perlman play this kind of tough guy before. But its okay, because you'll be having so much fun with it. This is a classic example of a movie that is a little bit better than it had to be. So pop this on and enjoy the ride.